If, indeed, there were an imminent threat of attack on the United States, Obama would be legally entitled to launch a military operation. The United Nations Charter, which prohibits the use of military force, allows an exception when a country acts in self-defense. Under the well-established Caroline doctrine, the “necessity for self-defense must be instant, overwhelming, leaving no choice of means, and no moment for deliberation.” The only problem is, Obama admitted, “We have not yet detected specific plotting against our homeland.” Citing only the vague possibility of future “deadly attacks,” Obama nevertheless declared a perpetual war with no specific end time. The only other exception to the UN Charter’s prohibition on military force is when the Security Council has given its approval. Obama said he would chair a meeting of the Council in two weeks’ time to “mobilize the international community.” But the Charter requires that the Council countenance the military operation before it occurs. The proposed resolution the Council is slated to adopt will reportedly call on countries to criminalize recruitment and travel of foreign fighters that join extremist military forces, and require the sharing of airline passenger information. It will not, however, authorize military force. Obama’s war violates the UN Charter, a treaty the United States has ratified, making it part of US law under the Supremacy Clause of the US Constitution. Obama’s war also violates the War Powers Resolution, which permits the president to introduce US Armed Forces into hostilities or imminent hostilities only in three situations. First, after Congress has declared war, which has not happened in this case. Second, in “a national emergency created by attack upon the United States, its territories or possessions, or its armed forces,” which again, has not occurred. Third, when there is “specific statutory authorization.” Obama has not asked Congress to authorize his military attacks. Indeed, Obama declared, “I have the authority to address the threat from ISIL.” He was relying on the Authorization for the Use of Military Force (AUMF) that Congress passed in 2001, which President George W. Bush used to invade Afghanistan. But that AUMF only authorized force against individuals, groups and countries that “planned, authorized, committed or aided” the September 11 terrorist attacks. ISIS did not even exist in 2001. In fact, Ayman al-Zawahiri, al-Qaeda’s leader, formally kicked ISIS out of al-Qaeda earlier this year. Apparently, Obama is also relying on the 2002 AUMF, in which Congress authorized the president to use the armed forces as he determines necessary and appropriate to defend the national security of the United States against the continuing threat posed by Iraq, and to enforce all relevant UN Security Council resolutions regarding Iraq. But since that threat and those resolutions were aimed at Saddam Hussein’s weapons of mass destruction, that license, too, has ended. Indeed, in June, the White House declared that the 2002 AUMF “is no longer used for any US government activities.” That means Obama’s current war is not simply a continuation of Bush’s Iraq war, and the 2002 AUMF does not provide Obama with legal license to mount his military attacks. The War Powers Resolution requires Obama to secure a new Congressional authorization for his war within 60 days of launching “hostilities,” or he must withdraw US forces within 30 days. The 60-day period runs out on October 7. Obama apparently feels unconstrained to comply with this law. 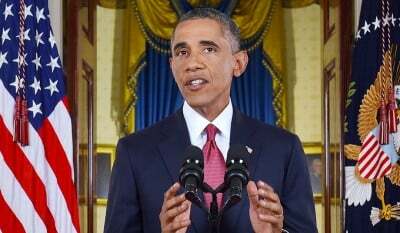 During the 2008 presidential campaign, Obama told the Boston Globe, “The President does not have the power under the Constitution to unilaterally authorize a military attack in a situation that does not involve stopping an actual or imminent threat to the nation.” Earlier this year, Obama said, “no country can maintain its freedom in the face of continual war.” Yet that is exactly what he is doing with his declaration of perpetual war. Obama is violating both US and international law. He is also risking even more blowback against the United States. The US government has destabilized the region with Bush’s Afghanistan and Iraq wars, and Obama’s killing of thousands of people with drones. Many Sunnis are less afraid of ISIS than they are of the puppet Shiite government the United States installed in Iraq, which tortured, raped, murdered and arbitrarily detained Sunnis during the last two and a half years. Playing both ends against the middle, Obama wants to fight ISIS in Syria without emboldening President Bashar Assad, who is also fighting ISIS. And Obama reserves the right to bomb in Syria, a sovereign country, in defiance of Assad. Obama is playing with fire. Besides being illegal, Obama’s war promises to exacerbate the volatile situation in the region, resulting in more hostility against the United States. Obama has said in the past there is no military solution to this conflict. He should use his leadership in the Security Council to secure a cease-fire, create a peacekeeping force, mount an embargo of all arms being sent to the region, and pursue a regional diplomatic solution enlisting Iran and Syria in the process. Perpetual war is not the answer.